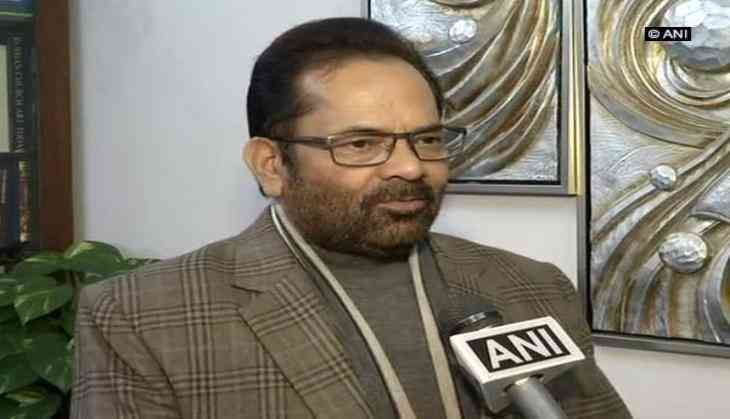 Union Minister Mukhtar Abbas Naqvi on 11 December said that the Congress cannot win the Gujarat Assembly elections using Pakistan as a pawn. The union minister told ANI, "Congress ko samajhna chahiye ke jis Pakistani political patang ko woh Gujarat mein udane ki koshish kar rahi hai, Gujarat ke log Bharat ke manjhe se aise patang ko kaatna jante hai. (Congress should understand and stop dragging the political agenda of Pakistan in Gujarat as people of the state will downplay it their nationalism). " "The people of Gujarat will give the Congress an appropriate answer for dragging Pakistan," said Naqvi. Yesterday, while addressing a rally in Gujarat's Banaskantha, Prime Minister Narendra Modi had alleged that former Pakistan Army director general Arshad Rafique helped Congress leader Ahmed Patel to become the chief minister of Gujarat. "Former Pakistan Army director general Arshad Rafique was backing and willing to help make Ahmed Patel the chief minister," he said. The prime minister had also questioned suspended Congress leader Mani Shankar Aiyar and former Prime Minister Manmohan Singh's meeting with the Pakistan High Commissioner. In the meantime, Pakistan Foreign Ministry Spokesperson Dr Mohammad Faisal has asked India to stop dragging Pakistan into its electoral debate.